How to light up the bathroom? How to light up the bathroom? Here there are the latest techniques and trends about light. The progressive consecration of the bathroom as the room of self care has brought a revolution in the way to conceive its furniture and décor. Large attention is aimed at the lighting aspect, in order to create an environment which should be also pleasant and relaxing. In this contest we can find many different techniques which came to life in the latest years. In the most contemporary bathrooms the trend is to give space to natural light: bigger rooms with large windows are nowadays preferred to little bathroom with opaque glasses, so sunlight can reach inside. Anyway, this effect can be recreated using artificial lights, reproducing sunlight. This is meant to satisfy an aesthetic need, but also a functional one (just think about the necessity of the right light while doing the makeup, not too white neither too yellow). A wide use of warm lights is suitable if the need is to have a pleasant, warm environment, while cold light is appropriate only in case of a very modern, minimal design. When choosing pieces of furniture for a bathroom, it is crucial to identify first the two indispensable spot lights, which are the general one and the mirror one. Talking about the general lighting, the commonest choices are a wall lamp or a ceiling one, suitable since it releases a diffused light. A good choice can also be a ceiling lamp with directional spotlights, in order to avoid annoying glares onto the mirror. Hanging lamps, instead, could be too large in case of a small bathroom, while it is better to avoid floor lamps, dangerous in case they get in contact with water. A different solution from the most traditional lamps just described, which is very trendy now, is to create plasterboard false ceilings in which it is possible to install directional spotlights. In this case it is essential to check if the materials are moisture resistant and top quality ones. To do this, it is necessary to verify the IP index of lamps, used to define the object resistance to possible water infiltration: if lights are close to the shower stall or bathtub and therefore subjected to water spurts or if walls are shorter than 2.25 m, they should have an IP index of at least 65 (the highest is 68). In the rest of the bathroom the suitable IP is 40-44, not less; only in areas completely under cover from water it is possible to choose a 21IP. Very functional for this type of setting are indirect lights, pointed towards walls or ceiling, surrounding light in the whole room; furthermore, the market offers indirect lighting systems with gypsum frame, so allowing the light to be perfectly integrated to the walls’ structure. 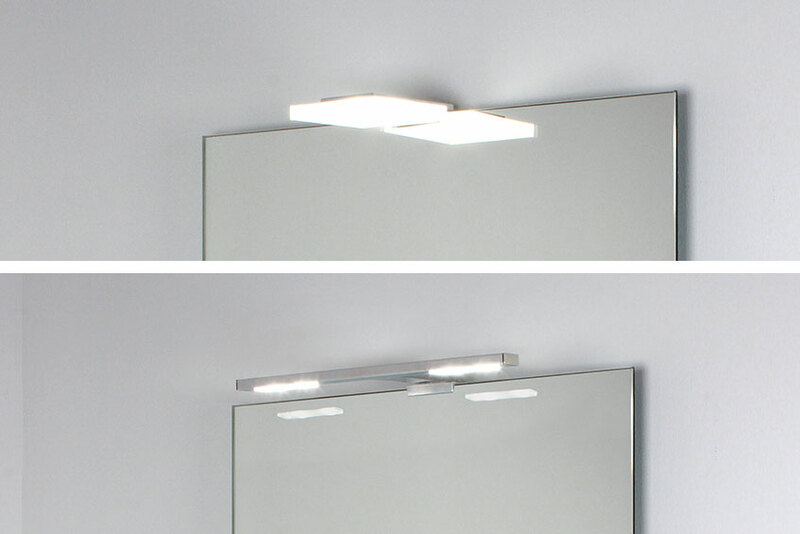 Of the same importance is the choice of the mirrors’ lighting typology: nowadays are available mirrors already equipped with lights, but also many items conceived to be included into mirrors. Light can be emitted vertically, pointing down (the flaw is that they create bothersome reflects onto the mirror), laterally or directly integrated to the mirror. The better solution is that of putting lights both up and at the side of the mirror: while the first ones improve the view, the second ones erase shadings. In particular, in case of a small mirror, it is possible to install a lamp of a unique spotlight, with a flux which is not that intense, otherwise two spotlights or more – directional or wall lamps – put laterally are suitable for medium or large mirrors. This type of lighting set is recommended also to improve the environment, considering the aesthetic point of view. 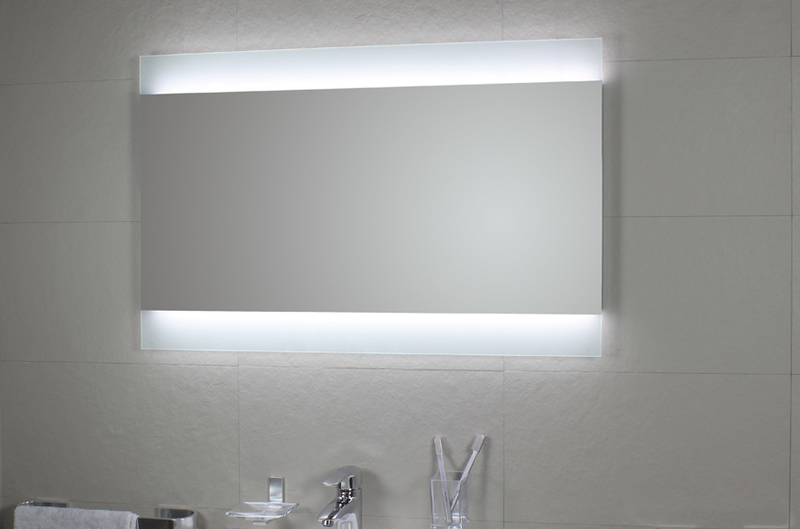 In any case, light has to be diffused and soft, not pointing directly to the mirror. Whatever is the favorite model, the best lighting technology is the LED one, which is long lasting and moisture resistant, does not overheat, does not emit ultraviolet or infrared rays and allows a notable energy saving in respect of halogen lamps. The market offers a wide range of light temperature, cold or warm, or able to change color: so it is possible to have an always different, new atmosphere in the bathroom. The latest technologies in terms of lighting, anyway, are related above all to atmosphere lights. Beyond the color changing LED, directional and equipped with dimmer, it is possible to create customized light flows and plays of lights and shadows. Furthermore, candle shapes bulbs are available, of a warm light, perfect to be placed around the bathtub to enjoy a warm bath. Finally, it is possible to find shower stalls with integrated lamp, as well as mirror lights which are not polluting and antibacterial. 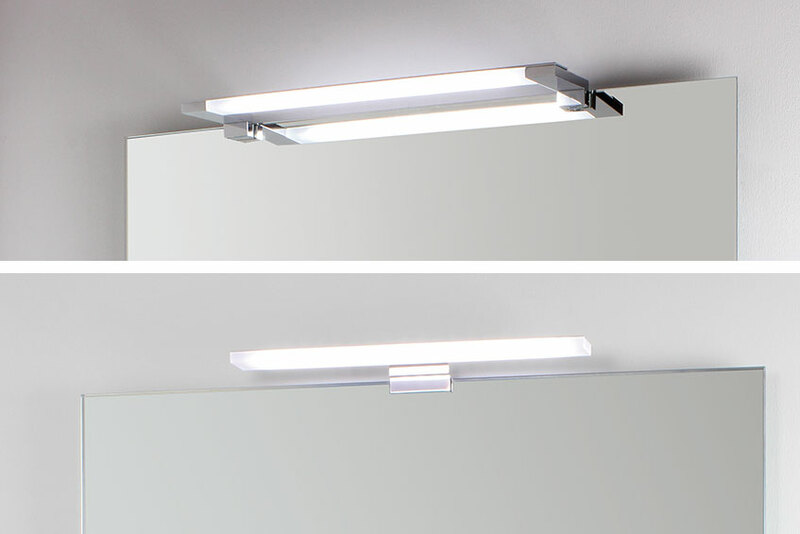 In the future, then, LEDs could be replaced or matched with the OLED technology, a luminous surface emitting a soft, no-shadow light, ensuring a very impressive energy saving.